This circular, sandstone bas-relief is a planisphere depicting the constellations in graphic form. It was added to the ceiling of a chapel dedicated to Osiris inside the Hathor Temple in the Dendera Temple complex in Upper Egypt, sometime after 51 BCE, during the Greco-Roman Period. In the early nineteenth century, it was blasted out of the temple’s ceiling by an antiquities collector and shipped to France after being discovered during Napoleon’s Egypt expedition. It currently resides at the Louvre. 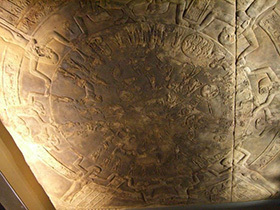 The Dendera Zodiac is one of the best-preserved ancient depictions of the observable stars. Although it contains many of the Zodiac symbols as they are known today, it is more accurately described as a star map than an astrological chart. It shows all five planets known to the Ancient Egyptians in an alignment that occurs once every one thousand years, as well as both a solar and lunar eclipse. The planet alignment allows astrophysicists to date the sky that’s depicted as having occurred sometime between June 15 and August 15, 50 BCE. The exact use or purpose of this unique depiction of celestial bodies is not clear, but many historians suspect that the 51 BCE death of Ptolemy Auletes, and subsequent rise to power the following year of his daughter, Cleopatra VII, the last pharaoh of Egypt, are directly related to its creation.